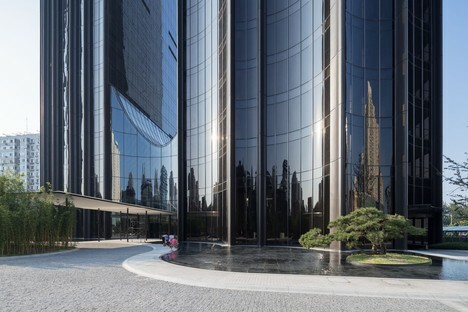 Photos by Iwan Baan and Hufton+Crow capture the relationship between the city of Beijing and the Chaoyang Park Plaza skyscraper, designed by MAD Architects, the studio headed by architect Ma Yansong. They offer an image of architecture in its urban setting. 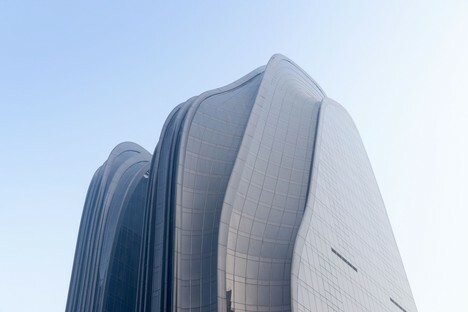 In Beijing, at the southern edge of the Chaoyang Park the largest public park in the city, the MAD Architects Studio, led by architect Ma Yansong, has designed the Chaoyang Park Plaza a 220,000 m2 complex of 10 buildings with offices and apartments by Armani. The presence of this large green park, a piece of nature in the city, is definitely one of the elements that inspired the architects. At the basis of the project is the idea of evoking the typical landscapes of Shanshui painting, a traditional style of Chinese painting in which landscapes and panoramas are not depicted with colour, but only in pen and ink. 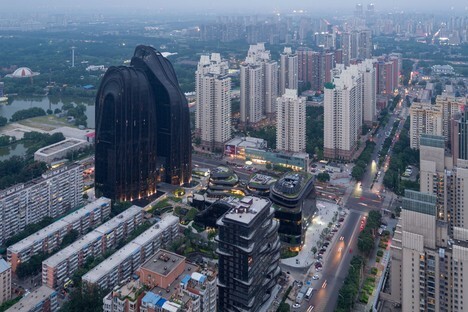 When presenting the project, architect Ma Yansong explained that in modern society architecture, man’s artificial creation, is seen as a symbol of power and technological development, distinct and separate from nature. This image is far removed from the traditional oriental vision of cities, in which architecture and nature are designed together. 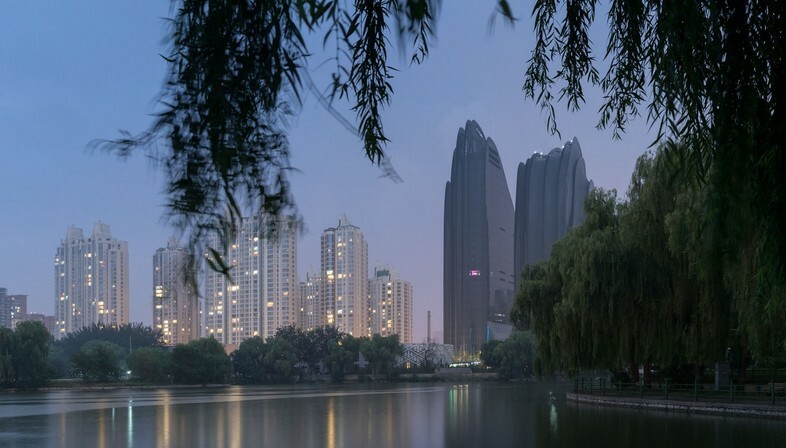 For the Chaoyang Park Plazaproject, the architects worked on the idea of blurring the boundaries between nature and artifice, so that one is designed as a function of the other. In the Chaoyang Park Plaza this idea has been made reality by introducing natural shapes and spaces to the architecture, like “ a mountain, a stream, a river, a valley and a forest”. 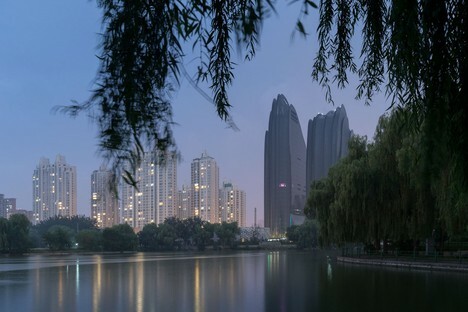 For example, the office buildings are two asymmetric towers created at the base of a small lake so that they appear as two peaks rising from the water. The commercial buildings are a few floors lower, and seem casually placed in the area, like rocks or the remains of mountains eroded by time. In reality, the position of the buildings has been planned to create an urban garden that offers meeting places for users. The same philosophy is behind the residential buildings, with offset balconies to ensure that every apartment has the right amount of natural light and visual contact with nature in the nearby park. The smooth, curved black and white surfaces of the complex help create a mysterious atmosphere that evokes Shanshuipainting. 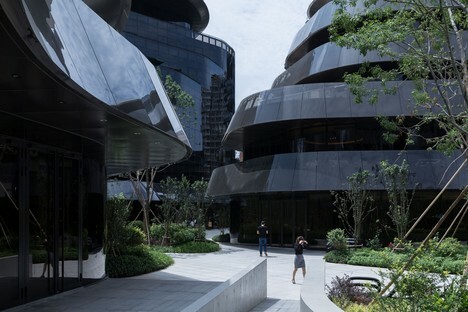 The architects have placed trees like pine and bamboo between the buildings, together with rocks and pools, all traditional elements of an oriental landscape that evoke a greater connection between architecture and the classical space. Nothing has been left to chance: even the signage design was the work of a Japanese artist, Kenya Hara. 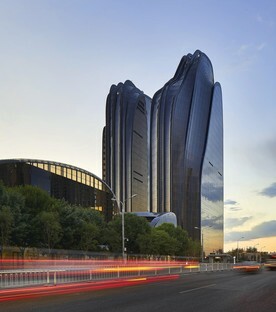 The Chaoyang Park Plaza was created with innovative integrated energy saving technology and has obtained LEED Gold certification from the U.S. Green Building Council . It is also a candidate for theCTBUH Awards 2018 in the Best Tall Building Asia & Australasia category and the awards ceremony will take place on 31st May in Chicago.